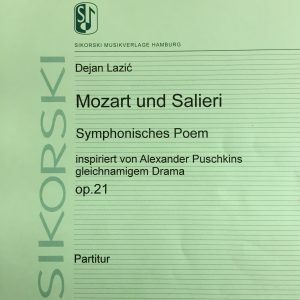 Standing ovation in the sold-out Hilbert Circle Theatre after the recent World Premiere of Dejan Lazić’s new composition, “Mozart and Salieri” – a symphonic poem inspired by Alexander Pushkin’s eponymous drama, op. 21! This work was commissioned and premiered by the Indianapolis Symphony Orchestra under the direction of orchestra’s Music Director Krzysztof Urbanski on 28 April 2017 in Indianapolis (IN), USA. Other works on the programme included Mozart’s Piano Concerto No. 21 in C major, K. 467 (with Dejan as the soloist), as well as Mozart’s and Salieri’s symphonies.